Antioch is a small residential, academically rigorous college founded in 1850 by Horace Mann who believed that students should “be ashamed to die until you have won some victory for humanity.” The work of identifying barriers to justice and equity is ongoing, sometimes messy, but is an integral part of what it means to be an Antiochian. Antioch has been an innovator in higher education since the 1850s and our core innovation, the co-operative education program, continues to be a centerpiece of the college. No other college or university requires students spend at least 25 percent of their undergraduate education working in full-time co-op positions in business, nonprofit, the arts, and government organizations around the world. Students graduate with a wealth of practical on-the-job experience and a unique story of adventure. Antioch is committed to supporting student autonomy – with a 7:1 student to teacher ratio our students utilize these close and personalized connections with their faculty in a process that empowers each student to design their major and play an active role in college engagement and governance. The College is committed to addressing issues critical issues of environmental sustainability. The Antioch Farm provides food for the campus dining halls, the geothermal system heats and cools campus facilities, a 5-acre solar array offsets the campus’s energy use. In addition, North Hall, a residence hall, is second oldest LEED certified building in the nation. Antiochians make a difference in countless ways in many different fields all around the world. Some examples include Congressional Del. Eleanor Holmes Norton ’60; Nobel Prize winner Mario Capecchi ’61; noted civil rights activist Coretta Scott King ’51; New York Times bestseller Nova Ren Suma ’97; Shelby Chestnutt, national organizing and policy strategist at the Transgender Law Center; and NPR radio journalist Kijin Higashibaba ’16. 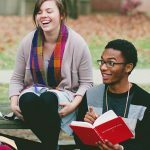 Antioch College’s values are in its commitments to our academic program and our student life. Antioch does not have division sports or Greek life. All tenure-track faculty have terminal degrees in their fields. Students design their own pathways to the Bachelor of Arts and Bachelor of Science degrees. Work continues to be one of the pillars of an Antioch College education. Students spend at least 25 percent of their undergraduate career in full-time work or research placements nationally or internationally. The world is increasingly connected, and effective students need to be able to work across boundaries of language and nation. With this in mind, all Antioch students are required to attain intermediate proficiency in a second language. For the most up-to-date listing, please check the college website. Each generation of Antiochians has created groups and clubs to serve their particular interests. In recent years, these have included independent student publications, events, arts and theater, and intramural athletics. If you want it, make it happen. Students have a strong one voice in the governance of the college and they exercise it, leading policy discussion and development. Antioch College is within walking distance of downtown Yellow Springs. The Village is nationally known as a vibrant arts community, recognized as “One of America’s Most Fun Small Towns” (Rand McNally/USA Today), “One of America’s 10 Coolest Small Towns” (Budget Travel), and “Best Ohio Hometown” (Ohio Magazine). The campus opens onto a huge park of ancient trees, which leads the eye easily to the 1,000-acre Glen Helen Nature Preserve, the legacy of Hugh Taylor Birch who, in 1929, donated the wooded glen to Antioch College in memory of his daughter, Helen. The 44,000-square foot Wellness Center was recently renovated to meet LEED standards and to provide the campus and community with space for group fitness classes, an indoor regulation-length swimming pool and more. Antioch College hasn’t had a football team since 1929. And we’re proud of that because it means that tuition dollars are placed where they should be — focused on providing rigorous academics and real-world work experience through co-op. Students at Antioch create clubs based on their interest. With our newly renovated wellness center and our 1,000-acre nature preserve, students have many opportunities to enjoy athletic and outdoor activities. Antioch College alumni are scattered around the world. No matter where their lives have led them, they are prepared for lives of significance and service, whether they choose to pursue graduate education or embark directly on a career. 88% of graduates were either employed or accepted into graduate school within six months, according to data available for the class of 2016. *Antioch College is a test-optional school. Scores are averages for those who submitted for Fall 2018 admission.